Though this extremely impressive country house sates back little over 150 years, there has been a building on the site since the early 16th century – the original having crumbled during the early 1700’s. It is, however, the current property which has the most intriguing history of all. During World War II it is reputed to have been mooted as an alternative meeting place to the House of Lords, while it is also thought the Adolf Hitler coveted it as his private English home should he have achieved total victory in Europe. 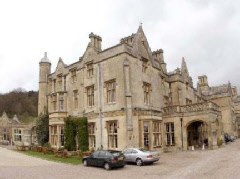 Dumbleton was also a regular haunt of Sir John Betjeman who, along with other notable members of the literati, attended lavish parties there. Today, Dumbleton Hall features over 30 guest rooms, including family rooms and others with four poster beds. Well behaved dogs are welcome by arrangement (charges may apply). Ideally located for exploring the north west area of the Cotswolds, the hotel is within easy reach of Broadway, Winchcombe and Cheltenham.